More than 1000 people are killed on the road in Kyrgyzstan every year, and many more sustain life-altering and life-limiting injuries. The majority of these incidents occur as a result of preventable behaviours such as speeding, drink-driving, or a failure to use seat-belts or child car restraints. This year to mark the World Day of Remembrance for Road Traffic Victims, EASST partners PA Road Safety in partnership with PF ProLex, set up in memory of Temir Dzhumakadyrov, organised a series of events in Bishkek to reinforce just how important it is to follow the rules of the road as doing so will save lives! PA Road Safety kicked off their week of actions with an Instagram campaign, inviting citizens to post videos based on observing the rules of the road. The aim of the campaign was to raise awareness and draw public attention to the consequences of failing to observe these basic rules. Following this campaign PA Road Safety held a ‘Public Talks’ event where participants were invited to share their personal stories and ideas on how to improve the situation on the roads in Kyrgyzstan, as well as honour the memory of loved ones they have lost. Among the stories shared were incredibly touching accounts by Meerim and Nora, who lost loved ones on the road, and the stories of Gulzar, Rosa and Gulzana who were all themselves injured in road traffic crashes. The week concluded with a press conference, with presentations from Tasnim Atatra, Acting Representative of the WHO Country Office in Kyrgyzstan; Imanaly Sarkulov, Deputy Head of the Road Traffic Police of the Kyrgyz Republic; Erkin Checheybayev, Deputy Minister of Health of the Kyrgyz Republic; Chinara Kasmambetova, Director of the PA Road Safety; and Nora Suyunaliyeva, Director of PF ProLex. 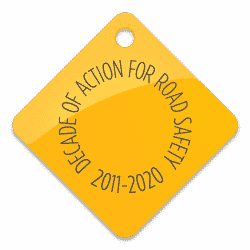 All participants noted the need for urgent measures to reduce road traffic fatalities and injuries in the Republic. They addressed the role of road infrastructure, human behavior and the problem of implementing state road safety programmes, while calling on the public to remember the victims of road traffic collisions and direct all their efforts to prevent any further tragedy on the roads. These activities were organised by PA Road Safety and PF ProLex, set up in memory of Temir Dzhumakadyrov, and implemented in close cooperation with the Road Traffic Police with the support of the OSCE and the UNDP.